When we talk about book marketing, fiction authors are always asking, “Will this work for me too? And I don’t blame them. Nonfiction authors may just have it easier, at least at the beginning. On the other hand, nonfiction sales don’t always reach the stratospheric levels of popular novels. 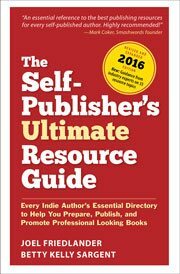 This whole topic came up recently while preparing for a presentation on how to navigate the varied and confusing publishing paths now available for authors. I thought about the many authors I’ve talked to recently, and what’s happened for them once they finished the publishing process and got their books into the market. To “cook down” the advice I put together for these authors, I separated it into separate lists, and here they are. The main obstacle for new fiction authors is obscurity. You can publish, but who will know? Who will want to buy my book? Where can I find those people? How would I quickly describe what’s great about my book? What’s unique about it, what does it have that other books don’t? What offer does my book make to a prospective reader? I’m 100% confident that if more authors put serious thought into these questions, there would be a lot more successful publications and fewer frustrated authors. How about you, do you have tips for fiction or nonfiction authors you’d like to add? I’d love to hear in the comments. Thanks for for the kind words, Joel. People with a good sense of marketing would realize that the subtitle that I recommended had the word “retirement” in it instead of the word “future.” This is really important for being found on Google and Amazon search engines. As soon as I thought of the idea of a book about retirement, I wanted the words “retire” and “retirement” in the title and subtitle. SEO cannot be underestimated. When I typed “retirement book” into Google today, 7 out of the top-10 listings involved my “How to Retire Happy, Wild, and Free” — out of 190,000,000 webpages vying for this term. No doubt having “retirement” in the subtitle (besides many other factors) helps get these types of results. Joel: I have a question about your third bullet point under Top Tips for Fiction Authors. Saying people who don’t know you are “the only people who count” caught my attention. Would you mind elaborating on what you mean by that? Hey Jason, I believe that Joel meant that you want to go outside of your personal network. Once you get “strangers” talking you are moving things along. You can start with your personal friends and as word of mouth grows, people who you do not know personally will know about your book and your marketing efforts will start gaining momentum. Please correct me if I am wrong Joel. I personally believe that “everyone” counts, but in a marketing sense you want to expand your reach, beyond just your personal friends and family connections. Also, I believe friends and family are going to support you regardless if your work is good or not. Getting credibility and reviews from people who do not know you is really a great accomplishment and feeling, might I add. Right on Dee. When authors switch from thinking about how the people they know will like the book, to thinking about why someone who doesn’t know her might be interested enough to buy it, they have turned a corner in book marketing. Ooops! When you said “don’t know you” I didn’t realize you meant personally, not “know” as an author. Reading it the way I originally did, it sounds like you’re dismissing an author’s current readership, which of course, I knew couldn’t be right. Yes, it does! Thanks, Dee. Reviews. Reviews. Reviews. Getting a spot, even when you are willing to pay for it, on some place like BookBub, or getting Amazon to boost your books, is based primarily on the number of reviews your book gets. Authors are shy about asking for reviews from people who buy their their books. I try to remind myself of that at book signing events, or when I give away a copy. I’ve started adding a note that I slip into the final page of books I hand-sell, that politely asks the reader to write a two or three sentence review on Amazon or Goodreads. Thanks for the tips. It’s a marathon to get noticed. You are right about that Larry. I am in the process of that now. Trying to spread the word beyond who I personally know is a challenge. Good point, Larry. I’m a big believer in reviews and always run a pretty extensive review campaign when I publish a new book, including retailer reviews, blogger reviews, industry reviews, anyone who might have an interest. Spend a lot of time thinking about your title and subtitle! Forget about being “cute” with these. I never did read the manuscript but I sent an email to the woman suggesting that she change the title and subtitle to “Retire to the Life You Love – Practical Tools for Designing a Meaningful Retirement”. The woman first emailed me back saying she didn’t think that there was time for making a change because the book was ready to go into print. Then she emailed me again indicating that the publisher and she had in fact changed the title and subtitle to “Retire to the Life You Love – Practical Tools for Designing a Meaningful Future”. At that point I just shook my head – and never replied to her. Fact is, I had given the woman and her publisher $5,000 of consulting for free but they never listened to me “completely”. For the record, she sent me a copy of the published book. The content appears to be much better than a lot of retirement books. The cover could be better but it isn’t all that bad. Getting back to the title and subtitle that I recommended, does anyone see why they made a major mistake by not sticking to exactly what I recommended? Keep in mind the title and subtitle of my retirement book are “How to Retire Happy, Wild, and Free — Retirement Wisdom That You Won’t Get from Your Financial Advisor.” The title and subtitle have no doubt in my mind contributed to the great sales for my book. Just a note that it took me three months after I started writing “The Joy of Not Working” to finally come up with the title. I had around 20 titles but none seemed to have that “WOW” factor. The day that I came up with “The Joy of Not Working” was the day I experienced an “Aha” moment. It took me another two years after the book was self-published to change the subtitle from “How to Enjoy Your Leisure Time Like Never Before” to “A Book for the Retired, Unemployed, and Overworked.” My Canadian distributor claimed that my changing the subtitle made a big difference in sales of the book. Again, don’t be “cute” with your title and subtitle. Ensure that you place a lot of thought into these. Also, test your title and subtitle with bookstore owners and the target market (potential readers) for your book. Don’t listen to friends, acquaintances, and family who don’t ever buy or read books. Thanks for the story Ernie. Your titles are models for me for incredibly effective title/subtitle combinations, and every nonfiction author should study them to learn an important lesson. As a writer with 27 years of writing experience under my belt, coming up with good titles isn’t a problem for me. I tend to use symbolism and metaphors for what I need to convey the book and its theme. But sadly…not many people (or teens for that matter) understand that. They just throw a title together–out of the blue–and run with it. And believe me when I say this, but 9 titles out of the 10 I encounter are just HORRIBLE.